For the past couple of weeks I have been so busy moving into my new apartment. I am very happy to finally be settled somewhere new and beautiful. Along the way I have discovered some tips to help me make this home a sacred, peaceful place. When moving into a new home, it is very important to make sure you are filling the home with positive energy that will last. Moving is a big transition, so tension and stress can be high. These are the kinds of energies you want away from your new space. Below are some steps that are very important to take in creating your new sacred, loving environment. One of the most important steps to moving is letting go of the things you no longer need. This step was so hard for me, but I had excellent help. A lot of things hold memories, but no purpose. Sometimes it is best to let those memories go. This allows you to detach, de-clutter, and move on. There's no better way to start fresh in a new place. Detachment is good for the soul because it reminds us that what we think we need is really all just an illusion. Leaving material items behind also helps ego get left behind. Certain attached, addicted, or dependent parts of us will be thrown away, too. 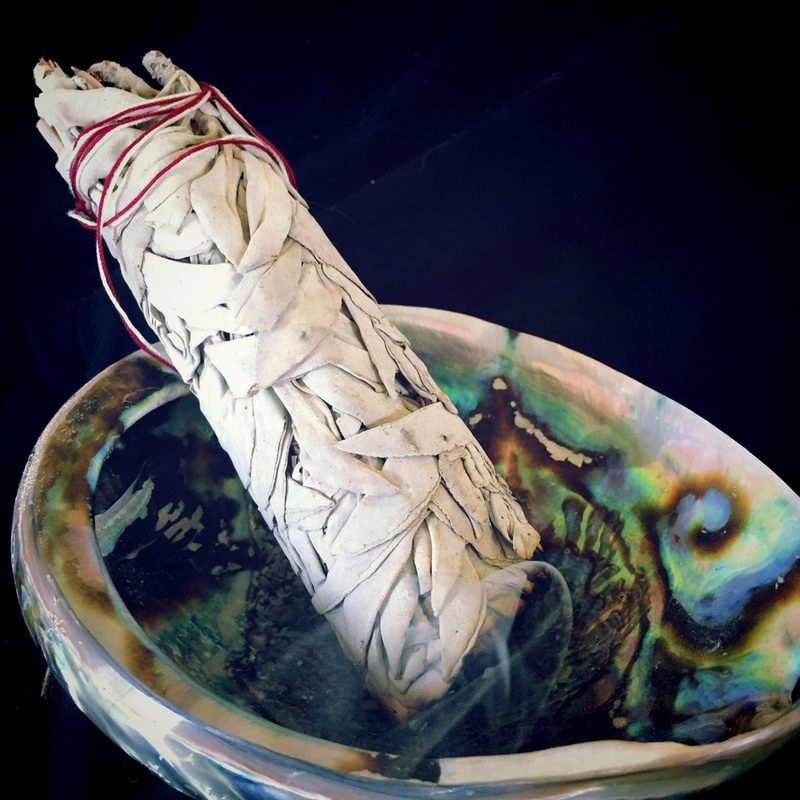 Smudging is an ancient Shamanic and Native tradition used to attract or repel the good or bad. You can find smudge sticks at metaphysical shops, farmers markets, natural food stores, etc. Sage is usually what is recommended because it repels any negative energy, including spirits or thoughts. When moving into a new place, you may or may not know what energies are tied into the house already. Moving can also be very stressful so negativity may be absorbed upon your arrival. To perform a smudging ritual, light the end of the smudge stick and hold over an abalone dish (if you don't have one, a regular bowl will work fine.) Make sure there are windows open. Start at the beginning of the house and work your way around. Each room you should be affirming peace, protection, positivity, and whatever else you would like to attract in your new home. When finished, end where you started and put out the smudge stick. If the light goes out on its own, you will need to cleanse that room for a longer period of time. There are many other smudges you can use instead of or in addition to sage. For example, I used a Cedar Smudge the day after the sage. Cedar is used traditionally when moving into a new house because it attracts good energy for new beginnings. You can also use lavendar, sweetgrass, rosemary, etc for relaxation, hope, or whatever you are trying to manifest. I know I've previously written about gridding a house with Selenite. This is such an important step to protecting a home. Selenite cleanses an area, just as sage does. The idea of the grid is to place Selenite in the four main corners of your home. This will ward off negative energy and keep the home at peace. Selenite calls upon the angels to protect the home. Black Tourmaline is another crystal that can be used in a grid. It works as a shield of any harm or negative energy. Whatever it is you are trying to manifest, you can use the corresponding crystal to grid your home with. If you are trying to bring love into the home, place Rose Quartz in the four main corners. If you are trying to manifest happiness and abundance, Citrine is best to use. By adding a crystal to each corner of the home, you are creating a force field of energy that will help attract the energy you desire. Last but not least, adding a bit of life to a home is a great way to create a positive environment. Bringing the earth inside of your home will help promote grounding and peace. Not only are plants beneficial to the spirit, but they can help freshen the air, make it easier to breathe, reduce stress, and induce motivation. Fill your empty spaces up with plants and you will see the affects of bringing life inside.